Donald Trump introduced his "Child Care Affordability Plan" tonight in Pennsylvania in an attempt to improve his polling with women and in this swing state. 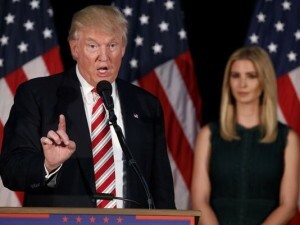 He shared the stage with his daughter Ivanka, who polls well with women, and spoke about her passion for the issue and personal participation in the development of the solution before introducing her father. Mr. Trump then invited 6 Congresswomen to the stage who had participated in crafting the plan. Mr. Trump's child care plan is receiving expected reaction. The left calling it useless and inadequate, comparing Trump's child care plan unfavorably to Hillary Clinton's based primarily on which candidate gives away the most. Trump only providing a $1200 rebate vs Hillary's 10% of income maximum. And, that paying for child care through tax credits doesn't help low income Americans who don't usually pay any taxes. Interesting argument given the left is always talking about tax reform that helps low income citizens - hard to do when those same citizens don't pay taxes- right Democrats? The reaction from the right is initially subdued given this is not a true blue Republican program at its heart. What I like is that "we are [not] wasting money on 6 figure income families, we are ... helping the truly needy members of our society." President Obama last year offered a simply political giveaway program and Hillary Clinton is doing the same thing this year. Everyone agrees that the cost of child care today is expensive. At the same time, caring for our most previous human resources requires high value skills. For all households where both parents either want or have to work outside the home, doing the math on child care costs versus incremental income is a potential deal breaker. At the same time, 40% of families are headed by single mothers, so the math is a waste of time. She must provide for her family. Isn't it refreshing to see a Presidential candidate, who is certainly looking for votes, offer a program that is paid for out of existing money! You expect a fiscally responsible solution from a Republican, including a reformed tax plan, but not one that acknowledges waste and the re-application of same to a new social program. Not bad.